Happy Needle and Thread Thursday, friends! We had an impromptu trip to visit my parents over the holiday weekend, and though that meant I wasn't able to make as much progress on my latest quilt as usual, it was so nice to see my family. Since getting back home though, I have been sewing into the wee hours of the morning (isn't summer grand?) and finished up the quilt top this morning. As I mentioned in my last post, I don't often work with precuts, so this pattern was all about making the cuts work. I'm pretty pleased with it! I love the medallion shape created in the negative space. I'm calling it Butterfly Kisses, since I think the points look a little like butterflies, and the big "kisses" are tough to miss. This quilt measures 60" x 75" and only used one layer cake (plus background yardage), so I feel like it was a pretty good "bang for the buck." I haven't yet decided whether to write the pattern for this one. It is different from many layer cake patterns I've seen, which are often simpler in design, but is it unique enough to write up? What do you think? While you think on that, let's check out some of the amazing highlights from last week's party. Oh goodness, there was so much awesomeness! 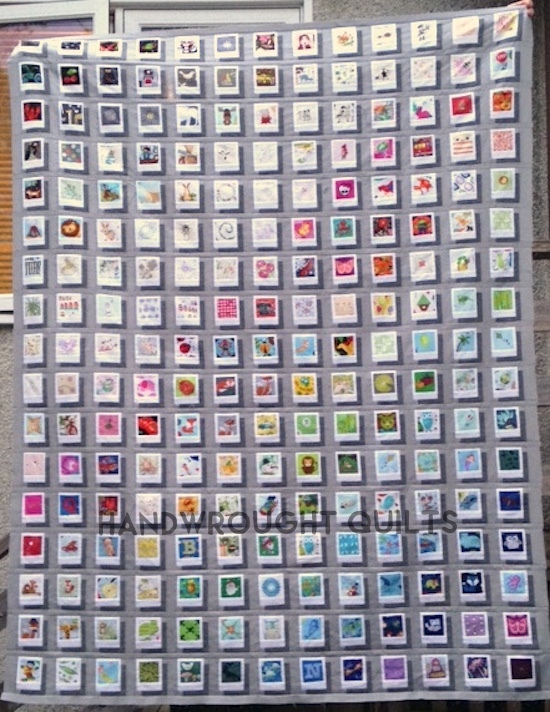 Nicole at Handwrought Quilts linked up this finished Polaroid quilt top! Wow- I know that so many hours went into that one. I can't wait to see some close ups of it! 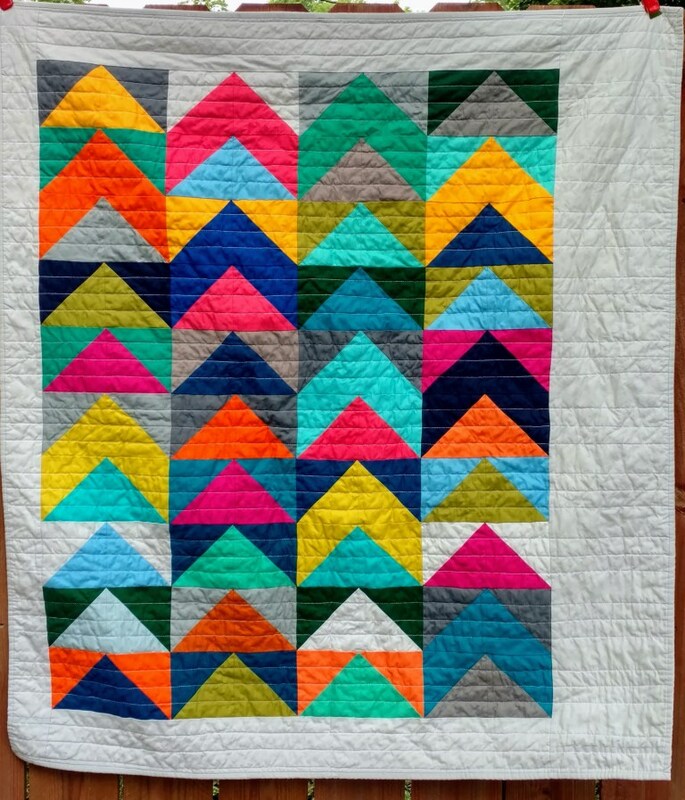 Tisha at Quilty Therapy showed off this Kona HST baby quilt. Love all of the bright colors and fun offset layout! 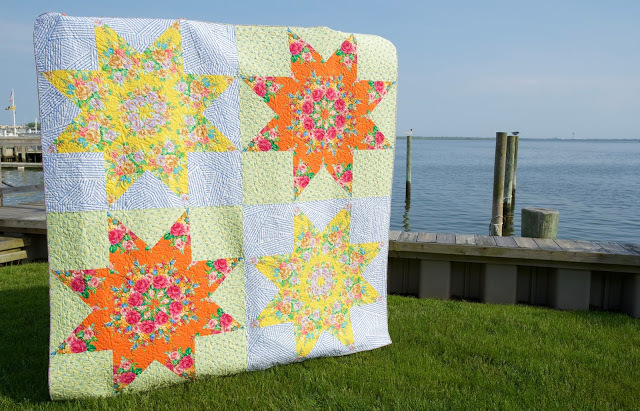 and Judy at Sew Some Sunshine shared this beautiful, amazing BIG Star quilt. I know I say this often, but it really is true. Some weeks it is SO difficult to choose only three features, and this was one of those weeks. I hope you're rocking and rolling in your sewing space this week, and I can't wait to see. Let's party! Love this !! when will it be available in your shop? A simple, but effective pattern that really shows off the fabrics. Beautifully done! So beautiful. Please, write the pattern!!! I think you should write the pattern! The secondary design is awesome. Beautiful! Yes, go for the pattern! Most layer cake patterns don't produce a top that has such a neat design. It's nice to see that a simple layer cake can make a top that has more than one design in it. I vote yes! Definitely write up! I have a layer cake that I want to use and this would be perfect. Can't wait to purchase the pattern! A pattern would be awesome! Thanks! I would write up the pattern. Those little butterflies bring a uniqueness to the design that I have not seen. I like the quilt very much! Great quilt! I'd probably make the pattern. I would vote for writing the pattern up :-) It's a beautiful quilt! PLEASE write up this quilt patter!! I have a layer cake just waiting for it! It is fabulous. Butterfly Kisses caught my eye, it's definitely different from all the "X" blocks I've seen. Such a beautiful quilt, please write the pattern. That's a great pattern! Yes you should definitely write the pattern! I have a few layer cakes that I don't know what to do with! 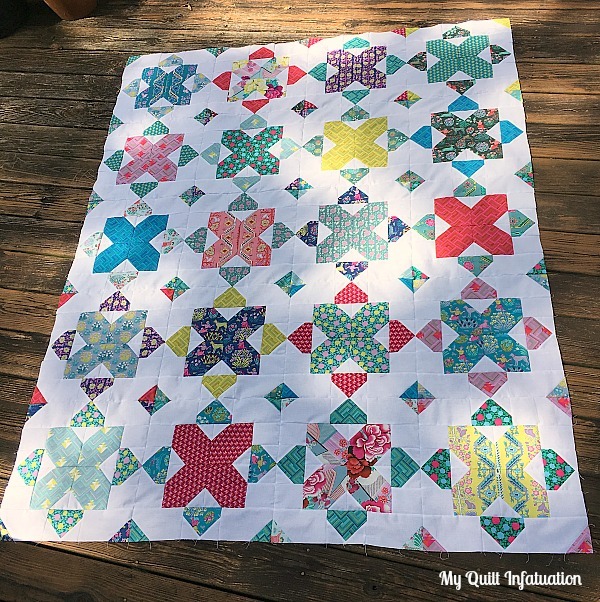 A pattern for this quilt would definitely help me out! You should definitely make a pattern for this quilt top. It is beautiful. Your kisses are beautiful, I definitely think you should make it a pattern! Yes, please write the pattern! I love this design. Thank you so much for featuring my quilt! That is such an exciting feeling. Your quilt looks pretty great too.